Israeli Ambassador to US warns Iran is continuing nuclear program, buildup in Syria in order to threaten Israel and the rest of the world. Israel's Ambassador to the US Ron Dermer warned of the danger of the growing Iranian military presence in Syria. Speaking at the American Israel Public Affairs Committee's annual conference in Washington DC on Sunday, Dermer termed Iran's foothold along Israel's northern border a "terror front". 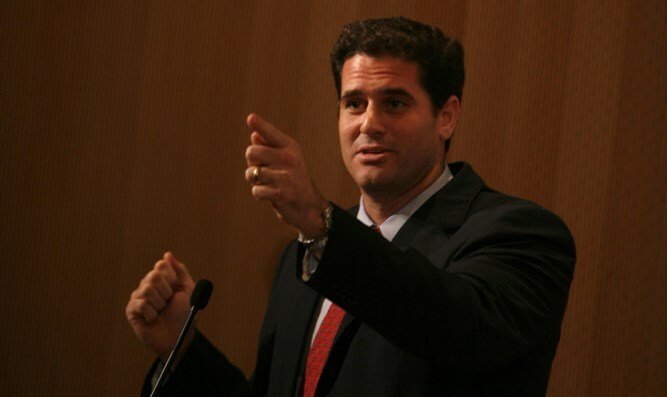 "The situation is very volatile because Iran continues on its mission to establish permanent military bases in Syria, to establish another terror front to attack Israel from Syria, and also to build factories for precision guided munitions in Syria and Lebanon," Ambassador Dermer warned. "[Prime Minister Netanyahu] has been very clear about his red lines in Syria; and unfortunately he's had to repeatedly enforce those red lines repeatedly," he said. The ambassador called the breach of Israeli airspace by an Iranian drone last month a "brazen violation of Israel's sovereignty and security." "We're just not going to allow Iran to advance its aims in Syria," he declared. "The more the world backs Israel's right to defend itself and to enforce those red lines, the less likely you're going to see an escalation." He said that the Iran nuclear deal "puts us all on cruise control, heading over a cliff, because the restrictions that the deal puts in place are automatically removed after a few years... Iran does not need to change its behavior at all. All they have to do is wait for the calendar to move. They can continue to be committed to Israel's destruction. They can continue to be the foremost sponsor of terrorism in the world, and at date that is approaching, year after year, all of these nuclear restrictions are removed. Dermer noted that the deal did not even freeze the Iranian nuclear program. "Iran is advancing its nuclear weapons program under this agreement... Right now, as we speak, Iran is doing research & development into advanced centrifuges." He warned that Iran threatens the entire Western world, and not just Israel. "Iran already has missiles that can hit Israel - so the new weapons it is building aren’t for us. They’re for all of Europe and ultimately for the United States." He called for the removal of the sunset clauses in the nuclear agreement, the imposition of "crippling sanctions" on Iran's ballistic missile program, and the imposition of a true inspection regime which will ensure Iranian compliance with its obligations under the deal.